If you are based in USA or another country in which RTG casinos are your best option then this casino is probably one of the safest places for you to play with good player focus and high quality customer service. For the European Player they are a decent option to check out RTG software. Blackjack is not excluded from the bonus terms so if you love playing blackjack it might be worth a try for this. If you have the full choice of casinos available to a European Gambler then this will be quite far down the list of casinos you should be checking out. The bonus is sufficiently poor that 90% of gamers will be best not claiming it. Other RTG powered sites do offer far better bonuses. USA players have very few choices when it comes to online casinos in terms of casinos and software providers willing to work in the turbulent US market. 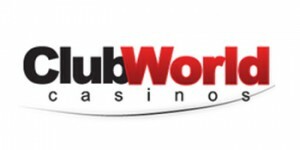 Club World uses RTG software which is one of the few software providers to stay in the US market and Club World Casino it is one of the best options for US players to play on in terms of their customer service, integrity and safe gaming. The casino is download only and you need to create an account if you want to try out the games but it is well worth your while doing so. I did find that the software ran a little slow on my PC when changing between games but my computer is not top of the range and I always have many programmes running in the background. It has been a while since I have played on an RTG casino and this review gave me a chance to rediscover the platform and see how it had developed since my last time playing with the RTG Software. 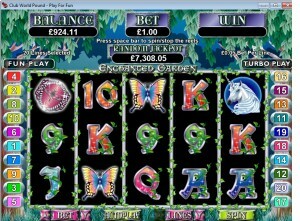 Club World Casino is a decent interface with good graphics and a great range of games. I was pleased by the depth and variety of games on offer. The video poker offers a great range of versions from Jacks or Better and Aces and Eights to many bonus poker variations and less common varieties of Video Poker and you can play from 1 to 100 hands at one time. There is a very respectable range of card, table and variety games available that will meet the needs of most players. They have a very respectable number of slot games including a good number of progressive jackpots and the games all play well with appealing graphics and well thought out design. If I was a US player I would probably spend quite a bit of time playing and enjoying the slot games here. If you are a US player and want greater variety than 3Dice has on offer then you are strongly advised to check out RTG software and more specifically Club World Casino. The same is also true if you are in one of the many other jurisdictions in which few software providers or online casinos are able and willing to operate in. For the European player however I do feel that we have so many better options with other software providers. There was never a moment where I did not think Microgaming software does this better and with even greater variety and they just do not have the range of innovative games that are available on multi-software platforms such as Bet365, Virgin or Mr Green Casino. If there are no restrictions on the casinos you have access to then I would recommend you check out RTG casinos to see if you like the software and prefer it to some of the other main casinos but otherwise I would only recommend it to European players who either want to exploit some of the juicy bonuses available on the platform or who want to play some different slot games. If I was in the USA I would probably spend most of my time playing on 3Dice and only venture onto RTG casinos for when I wanted a bit of extra variety when it came to games such as blackjack and also slots and also to take advantage of some of the bonus offers available. I really liked the graphics in their slot games and I did feel that each game was well designed with the player in mind but as I was spinning the reels on different games there was not a single one that gripped me or I fell in love with. I was always wishing I was playing on Microgaming which offers similar games but just better made or to access some of the choice and variety that other providers offer with generally games that provide a more unique experience to anything that the software was able to offer. Operating a gambling site servicing the USA market is challenging and requires having to work with huge pressures and in a very turbulent market. There are also difficulties for players in depositing and withdrawals completely separate of the casinos themselves. Some RTG casinos used dubious and unsustainable marketing to grab US players and ended up having slow cashout times at best and at worst resorting to dubious reasons for confiscating player funds and Club World Casino has taken great measures to be a quality, safe and reliable site for US players with excellent customer service standards and it has risen above all other RTG casinos with this dedication to provide a fair, safe experience with the very best in customer service. For the European gambler the excellent customer service still remains although not sufficiently good to take me to a site using software I enjoy less than Microgaming, Cryptologic, Playtech and several other providers. The exact bonuses available to depend on your jurisdiction but if you are new to understanding casino bonuses then I would strongly recommend that you do not claim this bonus as it has more complex and restrictive terms than many bonuses out there. Most RTG bonuses are what are known as “Sticky” bonuses which mean that they are bonuses that you can wager with but that you will not be able to withdraw. This greatly reduces the value of the bonus which is further reduced by caps on the wins that you are allowed from the bonus deals. You can choose between a Slots and a general games bonus. The general games bonus comes with a 100 times Bonus play through requirement and the Slots focused bonus currently comes with a 40 times bonus play through. Other RTG casinos have much better bonuses although if you are willing to take time to understand and work within the bonus requirements the bonus will still have value for many players. Only being able to withdraw 5 times the deposit amount from a bonus though does mean that if you play games where you can win more than say £500 on a £100 will not give you this extra value. Overall Club World Casino provides a very satisfactory playing experience and it represents a good opportunity to try out the RTG platform which though not one of my preferred choices is definitely a solid platform offering considerable quality, range and depth for any gamer.